Are you searching for a new car without the new-car price tag? At Jim Burke Hyundai in Birmingham, AL, we have an amazing selection of Certified Pre-Owned Hyundai cars for you to explore. If you’re tired of filling up on fuel every week, then a Certified Pre-Owned Accent is the car for you. As one of Alabama’s premier Hyundai dealerships, Jim Burke Hyundai serves Hoover, Tuscaloosa, Talladega and Jefferson County, AL with a large array of Certified Pre-Owned vehicles. Stop by our dealership at 1424 5th Ave. N. and check out a Certified Pre-Owned Accent today. To give you added peace of mind, Certified Pre-Owned Hyundai models undergo a rigorous inspection before becoming a Certified Pre-Owned vehicle. Every Certified Pre-Owned Hyundai has less than 60,000 miles on it and is less than six model years old. The vehicles come with a CARFAX Vehicle History Report, as well as a clean title. Our certified technicians conduct a 150-point inspection of every vehicle. If things aren’t like new, authentic Hyundai parts are used. Hyundai’s Certified Pre-Owned vehicles come with an extensive warranty to give you added peace of mind. Each Certified Pre-Owned Accent features a 10-yr./100,000-mile powertrain limited warranty, 10-years of Roadside Assistance, along with the remainder of the New Vehicle Limited 5-yr./60,000-mile warranty. With one of the best warranties on the road today, a Certified Pre-Owned Accent can be used on a regular basis with confidence. With an award-winning staff, Jim Burke Hyundai will get you into a Certified Pre-Owned Accent even if your credit score is amazing. Our website has a few features that allow you to see what kind of loan we’d be able to get you. We have a 30-second online application that you can fill out to see what kind of loan you’d get. There’s also a payment calculator to see what monthly payments would be. With these features and a talented staff, we’ll get you into a Certified Pre-Owned Accent with a loan that works for you. 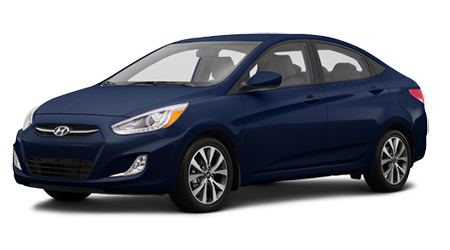 A Certified Pre-Owned Hyundai Accent is a compact car that has all of the same benefits as a new vehicle, but has a more affordable price tag. With Hyundai’s Certified Pre-Owned program, you can get a pre-owned Elantra with an extended warranty at an incredible price. Pay Jim Burke Hyundai a visit at 1424 5th Ave. N. and explore a Certified Pre-Owned Accent today.